BSC Filters - RFMW UK, Ltd.
BSC Filters supply Microwave filters and filter based sub systems such as Switched filter banks, Filter LNAs, Reconfigurable front ends, DLVA’s and Thin film technology solutions. Trading for over 25 years, BSC Filters are world-leaders in the design and manufacture of Microwave filters and filter based sub systems such as Switched filter banks, Filter LNAs, Reconfigurable front ends, DLVA’s and Thin film technology solutions. Covering frequencies up to 94GHz, BSC are dedicated to excellence in all aspects of filters and diplexer design. BSC Filters are pioneers in the use of ‘Exact Filter’ and our patented ‘Elliptic’ technology. BSC’s custom filter design expertise and production facilities are used to produce devices ideally suited to the particular needs of any application. The MOD recognised manufacturing site covers 14,000 sq ft and is registered to ISO 9001:2008 and environmental standard ISO 14001:2004. Key Defence and Aerospace customers are benefiting from adherence to SC21 and Lean improvement programme. To date over 4000 filter based designs have concluded. Research investment has yielded several European milestones in technology advancements such as Psuedo elliptic filters, GaN filter LNA, High selectivity Agile filters and thin film technology. Adaptive Filtering techniques are utilised to produce Reconfigurable Switched Filter, Tunable Filters and Switched Filters and can be realised to 18GHz. A UHF Agile solution recently completed produced a band-pass 225 to 400 MHz and power handling of 50W, with key features of Passband Insertion Loss: of 4 dB max at a VSWR of 2:1. Frequency band is covered in 88 steps of 2MHz using a 8 bit parallel interface. BSC provide Thin Film technology for EU sourcing (allowing ITAR free solutions if required). Thin film presents new opportunities to take advantage of our leading I.P. in filtering design capability. Technology provides an opportunity to “add value” to filter technology, for example -integrating amplifiers/switches TR modules. 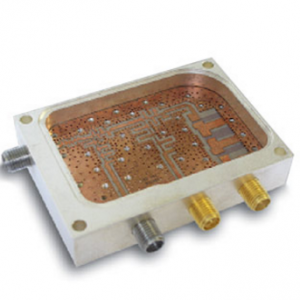 Millimetric frequency solutions to 90GHz have been manufactured, a solution example being a Tuning free, Dual 11 section folded design for Extreme Military Environment. The unit was designed using BSC Mode-Matching and commercial software. 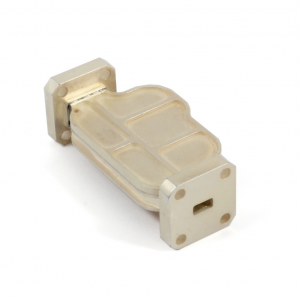 For lower frequency applications Satcom and Radar market continue to utilise waveguide techniques for low loss and high power in bands such as C,S, X, KU, DBS and Ka. 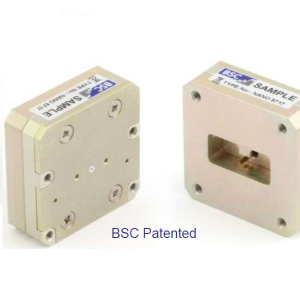 Suspended Substrate solutions can be applied to Frequency Ranges of 500 MHz to 50 GHz and allow for Wide Bandwidths of 10% upwards (multi-octaves) with extremely long Stop-bands and Complex Multiplexing. This technology can provide structures for Bandpass, Bandstop, Diplexers, Multiplexer, Lowpass and Highpass. 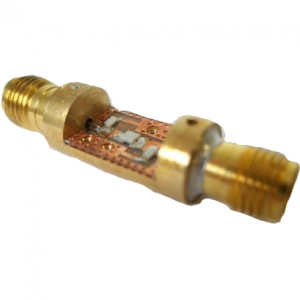 Lumped element designs, also referred to as Chip and wire technology – is typically applied to applications up to 4GHz with long stop bands and bandwidths ranging from 1% to multi-octave. The technology can be applied to Structures such as Highpass, Lowpass, Bandpass, Notch, Multiplexer, Equalisers. Where space is limited and high performance is required, Ceramic devices offer an ideal solution. The technology features an inherently high-Q for such a small space envelope, and is an obvious choice for low power PCB-based systems below 4.5 GHz operating band. BSC Filters have a large design precedent where the application is intensely size-critical. Our expertise in many filter technologies, and designing these to operate in non-standard, often restricted space envelopes is well established, and our Ceramic Filters are no different. Video shows a broadband sweep of performance highlighting how the band can be channelised using the Reconfigurable filter concept. EW threats typically very wide band – some radar signatures require 500MHz+ analysis BW and continue to increase…. Agile Notch or Bandpass filter covers 225 – 400MHz in 2MHz steps with power handling of 50W. Video shows the tuning response. 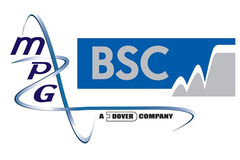 To support the ongoing expansion of BSC Filters product range and diversification into wider markets including space, BSC have installed & commissioned a Class 10,000 clean room facility. Many of the latest developments in the BSC Filters portfolio focus on miniaturised, active function; their recently-acquired wire-bonding facility will shortly be up-and-running, and will enable more direct integration between filters (including their Thin Film solutions) and on-substrate active devices. With the growing trend towards a commercial off-the-shelf approach in commercial space applications, BSC filters are ideally positioned to offer practically-qualified space solutions without the more traditionally attendant cost demands.